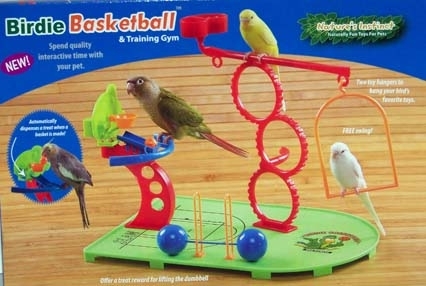 Home > Toys > Small Bird Toys > Birdie Basketball! Small BirdsFinally a REAL bird gym, complete with a basketball and hoop! Spend quality time with your little athlete teaching him the art of shooting hoops. When a basket is made, a treat reward dispenses. Your reward is priceless interaction with your pet. After shooting a round of hoops he can manipulate the agility rings an then pump a little iron for a full birdie workout.